Albany arrest watch: "Federal prosecutors are expected to announce criminal charges against New York state Senate Majority Leader Dean Skelos imminently, possibly as soon as Monday, in connection with a continuing corruption investigation, according to a person familiar with the matter," reported the Wall Street Journal on Friday evening. Traffic alert! Via the White House: "On Monday, May 4, the President will travel to New York, New York to deliver remarks at an event at Lehman College launching the My Brother's Keeper Alliance, a new non-profit organization. Following this event, the President will attend DNC events." There'll be a flurry of activity on Monday and Tuesday around the two special elections taking place in New York City on Tuesday: voters on Staten Island and a small chunk of Southern Brooklyn will select a new congressional rep and voters in central Brooklyn will select a new Assembly member (AD43). See NYC Votes' voter guide here. New York City Public Advocate Letitia James is in Israel this week on a 9-day visit with a 16-member NYC community delegation, which left Sunday evening. Her office says that further details of James' trip will be made available upon her return. Mayor Bill de Blasio is expected to unveil his fiscal year 2016 Executive Budget on Thursday, May 7. 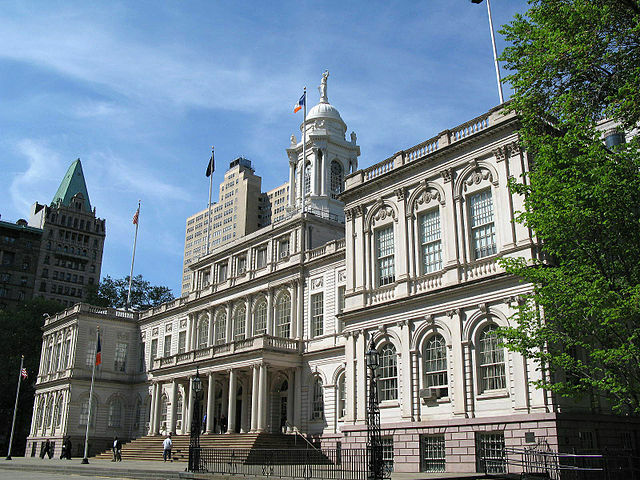 There is a variety of additional spending being sought by City Council members and advocates that was not included in de Blasio's preliminary budget. The most high profile is, of course, funding for additional NYPD officers. The Council has asked the mayor to include funding for 1,000 additional officers and it is looking like the mayor will at least meet the Council half-way, but we're still awaiting confirmed details. De Blasio is also expected to release his administration's first update to the city's 10-year capital plan on Thursday. On Friday, de Blasio was involved in a strategy session around lobbying for strengthening of rent laws in Albany. As legislative session continues this week in the capital be prepared to see more and more efforts to influence policy as lawmakers negotiate a whole host of issues, from the DREAM Act to rent regulations, mayoral control of schools, minimum wage, criminal justice reform, and much more. Lawmakers are again due in Albany Monday through Wednesday this week. Thursday is set to see a summit on teacher evaluations in Albany and a major Assembly hearing on criminal justice reform in Manhattan - see below for details. You know what they're saying: the Bronx is the new Brooklyn. And it's Bronx Week 2015 this week, which Borough President Ruben Diaz Jr. and others kicked off on Sunday. Fitting that the President will be in the Bronx on Monday. As always, there's a great deal happening at the City Council and all over the city, with many events to be aware of; see below for our day-by-day rundown. Monday morning, Manhattan Borough President Gale Brewer will attend a veterans roundtable and brunch hosted by John Jay College. Monday morning will be a memorial service for Victor Gotbaum, renowned New York City labor leader. At 10:30 Monday morning, Governor Andrew Cuomo will participate in an announcement by phone, according to his public schedule. The announcement will be made from Bak USA in Buffalo. The Wall Street Journal is reporting that "The Mayor's Fund to Advance New York City on Monday plans to introduce an initiative to connect 100,000 young New Yorkers with internships, mentorships and summer jobs by 2020...Chirlane McCray and her husband, the mayor, have secured $3.2 million in private donations to create the Center for Youth Employment, a public-private enterprise to increase the number of job programs for New Yorkers age 14 to 24 by 75% during the next five years." An 11:55 a.m., Mayor de Blasio will be interviewed at Tech Crunch’s Disrupt NY: “New York Mayor Bill de Blasio will join us on stage at Disrupt New York for an amazing interview with our own Kim-Mai Cutler...He’s already working hard at making changes to the city that aim to increase network connectivity for all five boroughs and Digital.NYC, a hub for startups in the city. Join us on Monday at noon for this intimate and unique interview on our Disrupt NY stage.” Watch livestream here. Also Monday at noon, “Council Member Paul Vallone and Council Member Corey Johnson will hold a rally calling on Mayor de Blasio to include funding for full service animal shelters in Queens and the Bronx in the fiscal year 2016 executive budget.” They will be joined by animal rights activists. Monday’s City Council schedule will include a meeting of the Committee on Transportation for an oversight hearing “examining the importance of federal funding for city transportation systems” and to consider a resolution supporting the GROW AMERICA Act. At 1:30 Monday, schools Chancellor Carmen Fariña will visit "Bronx Career and College Preparatory High School with Deputy Mayor Richard Buery to make an announcement." At 3 p.m. on Monday, the State Senate will be in session. On Monday at 6 p.m., elected leaders in Brooklyn are holding an “All Lives Matter Criminal Justice Town Hall.” It is being led by Borough President Eric Adams, State Senator Jesse Hamilton, Assembly Member Nick Perry, Council Member Laurie Cumbo, and District Leader Shirley Patterson. Monday evening, NYU Wagner will host its Jacob K. Javits Visiting Professorship Lecture titled “Who Are the Policy Workers and What Are They Doing? A Citizen’s Perspective on Democratic Accountability in Modern Governance,” given by Anthony M. Bertelli, NYU Wagner Professor of the Politics of Public Policy and Vice Dean for Academic Affairs and Research. Tuesday is (Special) Election Day! New York’s 11th Congressional District and 43rd Assembly District will see voting and the election of new reps.
Tuesday’s City Council schedule will include a meeting of the Subcommittee on Zoning and Franchises to consider land use applications; and a meeting of the Subcommittee on Planning, Dispositions and Concessions to consider land use applications. Tuesday afternoon, the State Senate will be in session at 3 p.m.
Also Tuesday evening, City Council Member Andy King and his staff will be hosting a "Constituent Services Night" at the Edenwald Community Center in the Bronx, part of his series in which "every other week in a different NYCHA housing development in the 12th Council District...Services will include resources and solutions for housing, food stamps, immigration, Access-A-Ride and basic services." On Wednesday morning, Mayor de Blasio is due on MSNBC's Morning Joe. Also Wednesday morning, Stroock will host a government leadership forum titled “Is New York Still A Democracy?” Panelists will include Congressman Jerrold Nadler; DeNora M. Getachew Campaign Manager and Legislative Counsel at the Brennan Center for Justice at New York University School of Law; and Douglas A. Kellner, Co-Chair of the New York State Board of Elections. Robert Adams, former New York State Attorney General and Chair of Stroock’s Government Relations Practice, and Jerry H. Goldfeder, Stroock Special Counsel and Election Law attorney will moderate the panel discussion. At 11 a.m. on Wednesday, advocates are expected to rally outside Governor Cuomo's Manhattan office as part of a renewed push to strengthen rent regulation laws that are being negotiated in Albany. From 9 a.m. to 1 p.m. Wednesday, LiveOn NY will host its 20th Annual City Hall Advocacy Day. “Meet face-to-face with your Council Members; Advocate for those seniors who are too frail to be there; Advocate for more money the Department for the Aging; Represent your senior center; Help to keep programs for future seniors." The day will include morning and afternoon meetings with City Council members sandwiching a City Hall press conference. Wednesday, the State Senate will be in session at 11 a.m.
Wednesday afternoon, Manhattan Borough President Gale A. Brewer will host a Small Business Roundtable. Also Wednesday evening, Council Member Mark Levine will host a Participatory Budgeting Party: “We will share project details for the winners, next steps in the process, and ways you can get involved in next year’s Participatory Budget.” This event is another in a string of PB events by council members in which they reveal and/or celebrate the PB-funded projects chosen by constituents and the PB process. Mayor de Blasio is set to unveil his fiscal year 2016 Executive Budget on Thursday as well as his update to the city's 10-year capital plan. Thursday’s City Council schedule will include a meeting of the Committee on Land Use to review all items reported out of the Subcommittee hearings. Thursday evening, the Brennan Center for Justice at NYU will hold a discussion titled “State of Money in Politics” - “The Supreme Court's landmark decision in Citizens United v. FEC reshaped the American political landscape, giving the wealthy more power to influence elections than at any time since Watergate and opening the floodgates for dark money in U.S. elections. Five years after the Supreme Court decision that set these trends in motion, what is the state of money in politics today? What are the emerging issues and paths for reform going forward?” The panel will feature Jeff Clements, Board Chair at Free Speech for People and Author of “Corporations Are Not People”; Zephyr Teachout, Associate Professor at Fordham Law School and Author of “Corruption in America”; and Ellen Weintraub, Commissioner of Federal Election Commission. On Saturday afternoon, City Council Member Corey Johnson will host the First Annual West Side Summit, where he will deliver his State of the District Address, and announce winning projects from participatory budgeting.